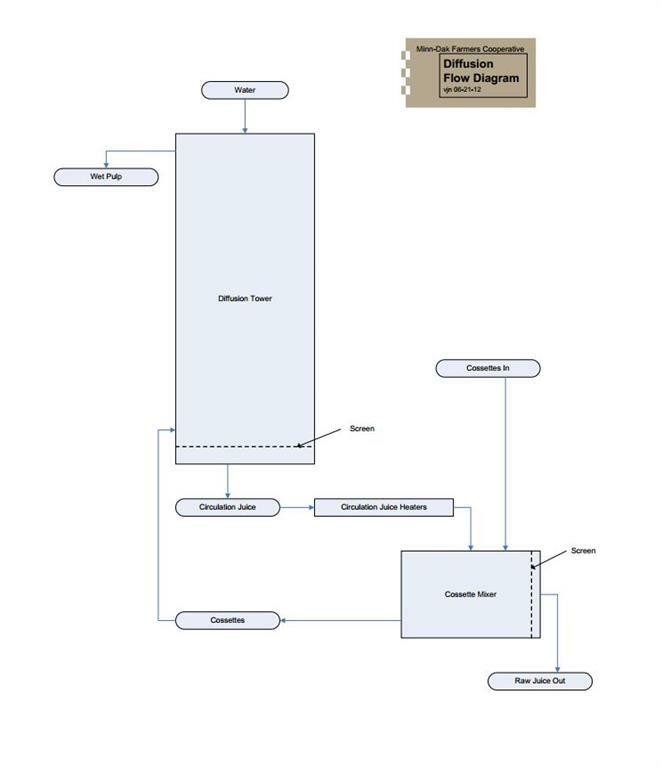 Three flow diagrams are included in this basic processing overview. 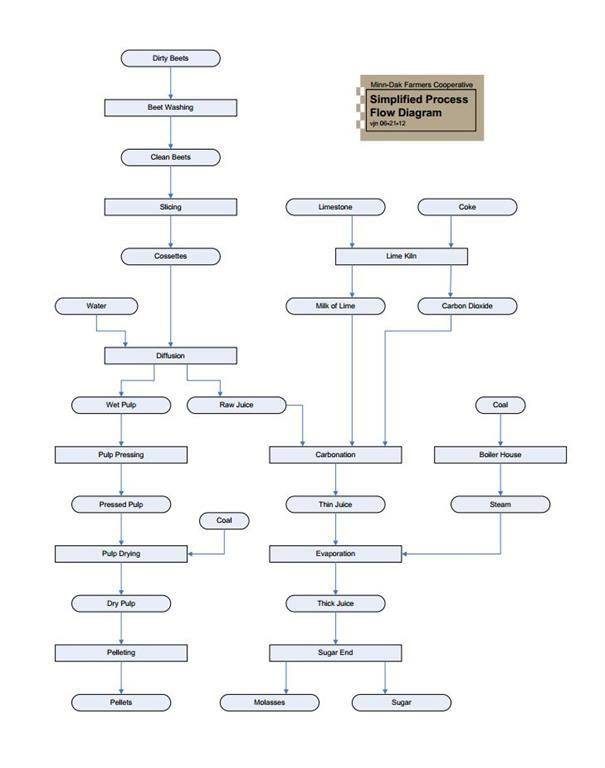 The simplified process flow diagram shows the path the beets take through the factory to become end products. It also shows where some of the other expensive raw materials and supplies are used. The diffusion flow diagram shows where the water insoluble nonsugars are separated from the rest of the beet. The sugar end flow diagram shows all the product flows on the sugar end. The bar graph shows the composition of the beets, some intermediate products, and the end products, in terms of sugar, water, water soluble nonsugars, and water insoluble nonsugars. A nonsugar is any substance that is not sugar (sucrose) or water. Water soluble means that a substance will dissolve in water. Sugar is water soluble because it will dissolve in water. Sulfate, phosphate, sodium, and potassium will all dissolve in water, so they are water soluble nonsugars. Cellulose, a main component of sugarbeets, will not dissolve in water, so it is a water insoluble nonsugar. The bar graph also shows how much intermediate or end product results from processing each 100 tons of beets. The bars for the intermediate products correspond directly with the lines between the processes on the flow diagram. For example, 100 tons of clean, sliced beets entering diffusion (along with several tons of water), yields two intermediate products, 44 tons of wet pulp and 110 tons of raw juice. As the wet pulp travels through the pulp presses, the pulp dryer, and the pellet mills, it becomes pressed pulp, dry pulp, and pellets. As the raw juice travels through carbonation and evaporation, it becomes thin juice and thick juice, which is the input for the crystallization process. Making sugar from sugar beets involves four basic processing steps: diffusion, carbonation, evaporation, and crystallization. All of these steps are separation processes. Diffusion involves the separation of the water insoluble nonsugars from the rest of the beet. Most of the soluble components of the beet are dissolved in water and form raw juice. The raw juice is removed through a screen and what is left is the insoluble portion of the beet, the wet pulp. Carbonation involves the separation of some of the water soluble nonsugars from raw juice. Only about 28% of the water soluble nonsugars are actually removed in this step, but many others are destroyed or converted into compounds that are easier to process in later steps. Evaporation involves the separation of water from thin juice. Over 100 tons of water must be evaporated for every 100 tons of beets sliced. To evaporate that much water, tremendous amounts of heat must be supplied. The heat is supplied by coal and carried to the evaporators in the form of steam. The coal for evaporation costs the company more than any other process supply. 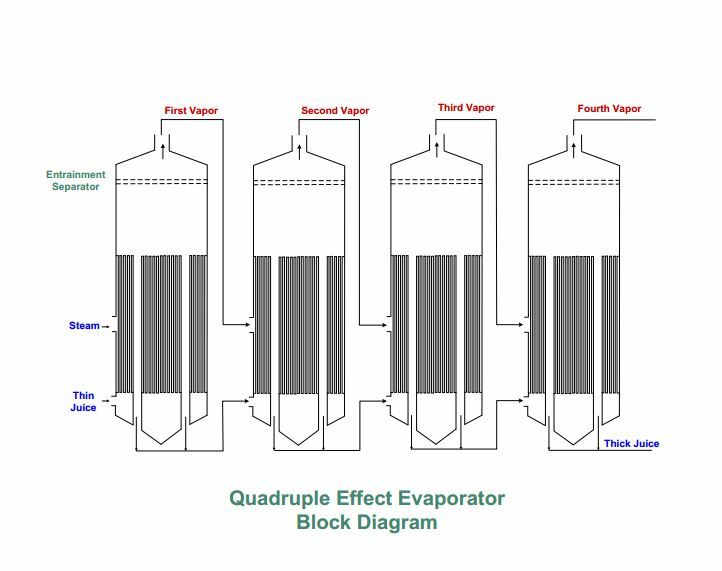 The quadruple effect evaporator block diagram shows the evaporation process with thin juice entering the system and thick juice being the final product in this stage of operations. Crystallization involves the separation of sugar from the thickened juice. The juice left over after crystallization is called molasses. It contains the remaining nonsugars and about an equal amount of sugar, which, economically, is not feasible to remove. Because these processes and products are referred to so many times in terms of the amounts of sugar, water, water soluble nonsugars, and water insoluble nonsugars they contain, special names have been given to the ratios of the amounts of one of these components to the other or others. Percent sugar is one of these terms and its name pretty much explains what it means. It is the percent of the total weight of a substance that is sugar. If the average percent sugar of beets is 17.00, that means there are 17.00 tons of sugar in each 100 tons of average cleaned beets. If pellets average 5.80 percent sugar, there are 5.80 tons of sugar in each 100 tons of average pellets produced. Percent sugar is measured with an instrument called a polarimeter. Another important ratio is the percent of the total weight of a substance that is dry (not water). Depending on what substance is being tested and what method is being used to measure it, this ratio is called percent solids, percent dry substance, refractometer dry substance (RDS), or degrees Brix. When the dry substance of a juice is being measured, and all the solids are soluble, an instrument called a refractometer is usually used. Most juices’ dry substance are expressed in RDS. When measuring the dry substance of a material where the solids are not soluble, an evaporative method is usually used and the answer is expressed as percent solids or simply, dry substance. The evaporative method is used on pulp and pellets, and is performed by weighing a substance, evaporating all the water away, and then weighing the remaining dry substance. Percent moisture is the percent of the total weight of a substance that is water. It is measured by the same methods as percent dry substance and is equal to 100 minus the dry substance. Purity is the percent of the dissolved solids in a solution that is sugar. The key word in this definition is dissolved. Water insoluble nonsugars do not dissolve in water, so purity is not affected by water insoluble nonsugars. Purity then, is the ratio of the weight of sugar in a substance to the weight of sugar plus water-soluble nonsugars in the substance, expressed as a percent. If one hundred tons of beets contain 17.00 tons of sugar and 2.54 tons of water-soluble nonsugars, the purity is 17.00 divided by the quantity of 17.00 plus 2.54 or, 87.00 percent. The purity of a juice can be calculated if the RDS and the percent sugar is known. Since percent sugar indicates the relative weight of the sugar, and RDS indicates the relative weight of dissolved solids, purity equals the percent sugar divided by the RDS. An example is thick juice, which might be 50 percent sugar and have an RDS of 55. The purity is 50 divided by 55 or 90.9 percent purity.